The Aerobie Football’s patented curved fins push it into spectacular spirals every time. Rapid spinning means stable, accurate passes. Pocketed finger grips ensure the Aerobie football fits hands of all sizes, from young children to adults. Right handed throws only. Size: 9 inches long. Available in various 2-toned colors. Ages 5 and up. 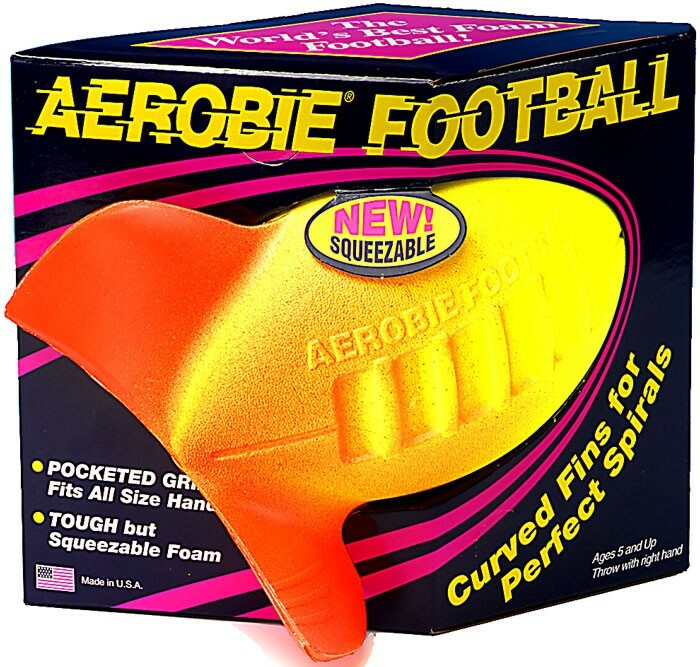 Perfect Spirals Every Time: Patented curved fins propel the Aerobie football into a perfect spiral every time. Increased Accuracy: Unlike straight fins which would slow the spin rate, the Aerobie football’s curved fins accelerate the spin, increasing the stability and accuracy of throws. Easy to Catch: Aerobie footballs slow to a wobble-free final glide, making them easier to catch than other footballs. Precision Grip: The patented finger pocket grip fits all size hands, making the Aerobie football easy to throw well. Only work for right handers.